Escape to one of 30 spacious and inviting guest rooms at The Inn at Glenora Wine Cellars, each beautifully appointed with Stickley furniture. Each room is designed to complement distinction with comfort and convenience. Every room features a private balcony or patio with a view of the vineyard, Seneca Lake and the opposing hillside. Mornings are mystical; evenings are tranquil. You'll find it is simply the perfect setting. 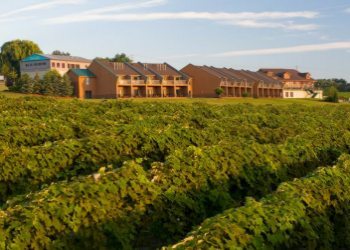 Reserve a room at the Inn and choose from a variety of packages which make planning your getaway to Finger Lakes Wine Country simple. Discover many wonderful packages offered throughout the year. Upon arrival we welcome you with a glass of Glenora sparkling wine. 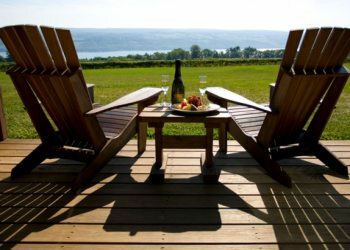 Then sit back and relax with a complimentary bottle of Glenora wine in your room on your private deck overlooking beautiful Seneca lake and the vineyards. When the Farm Winery Act of 1976 was passed, Gene Pierce, along with Eastman Beers, Edward Dalrymple, and Howard Kimble seized the opportunity to open the winery on Seneca Lake on the site of an old sheep barn. 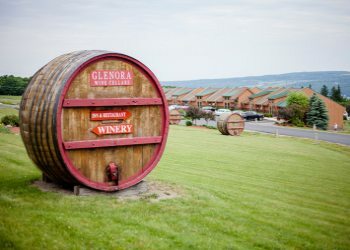 Glenora Wine Cellars produced 5000 cases and received instant acclaim in wine circles when its initial vintage won several medals at the New York State Fair wine competition. These visionaries watched their farm winery grow to a commercial producer and win recognition in Wine Spectator magazine as one of the world�s top wineries. Today, Glenora Wine Cellars is owned by Gene Pierce and Scott Welliver, who struck a friendship at a sail boat race in the early �70�s. Gene�s and Scott�s varied business experiences and shared values have been a great asset. These entrepreneurs have overseen the creation of the 30 room Inn and the Veraisons Restaurant, which offers guests from around the world the finest accommodations and cuisine in the Finger Lakes.